Today’s consumers are all about finding the best deal and coupons to save money on their purchases. With retailers sending offers directly to our inboxes and new daily deal sites following suit, consumers have led the coupon world online and have increased convenience and personalization in the coupon and deal world. Now consumers are getting even more deals even easier by finding apps to use on their smartphones when out shopping. Now, consumers don’t need to deal with planning and organizing before they head off to the store. By using some of the new iPhone apps available to help consumers find deals, they can now get coupons and offers on the go. Let’s take a look at some of the most popular apps to help consumers find deals. Technology has drastically changed the way consumers handle their own shopping experiences, and these smartphone apps, and others like them, make it a little easier for shoppers to find deals on the go. As technology makes it increasingly possible to find a great deal anytime and anywhere, consumers can take advantage of more customizable, last-minute coupons and offers from home and while out on the town. Foursquare is a popular app that allows users to check in to various locations and share with friends. Now, however, when you check into a location you may be alerted that there are deals going on too! Whether it’s a bar, restaurant, or store, you can find coupons and deals being offered in that location. Many iPhone users are fond of this app because of the social function combined with the deals. shopkick – Get FREE STUFF while shopping. The shopkick app represents the next step of finding coupons on the go, as users do not even need to “check in” in order to find out if the establishment they’re in has any coupons to offer. Rather, users simply turn the app on and allow it to track their location; once the app has sensed that the consumer is in a participating businesses, it will alert them to any available deals, reward points, or coupons available to them. Cellfire is a new mobile app that lets customers find grocery coupons and then load them onto the rewards card they already carry and utilize at their preferred markets. This way, customers no longer need to clip coupons or have them ready at check-out in order to use them. Shoppers simply browse the available deals – either from home before shopping or right there in the store – and select them to be scanned via their shopper’s card at check-out. 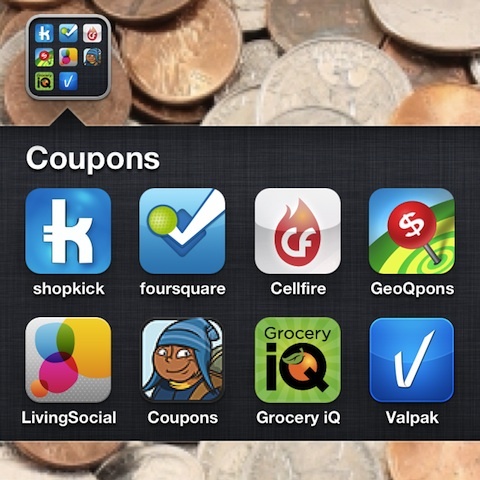 GeoQpons is another example of a coupon app for the iPhone that allows consumers to find out about and use deals on the go. GeoQpons takes information from local and national retailers and puts it all in one place for consumers to take advantage of whether they are browsing from home or are checking out an item while in the store. GeoQpons also has the handy feature of listing nearby retailers too so consumers can scope out better deals from other local merchants. One of the major companies behind daily deals delivered to your inbox is now in the mobile game as well. Using your iPhone, you can use the LivingSocial iPhone app to help you find deals and coupons near your current location. This app is great for spontaneous people on the go; need a manicure or a table for four within the next hour? This app, with it’s instant downloads and clear expiration times, makes it simple to get coupons for activities and experiences through your phone. By: Valpak Direct Marketing Systems, Inc.
Valpak has an iPhone app which lists deals in your neighborhood for businesses like restaurants, auto repair, medical, beauty, and more. To find what you really want, you can also search for deals and coupons by keyword. The app is free and worth checking out, especially if you’re already a fan of the postal coupons from Valpak in your mailbox. The coupons can be redeemed by showing them to a cashier on your iPhone. There is a Savings for You feature that helps you find discounts you would be interested in. Coupon Sherpa for iPhone is a simple app that gives you access to traditional printed coupons in digital format. These coupons are the in-store cut out coupons provided by merchants that you’re already familiar with. To use these coupons you have to email the image from the app to either yourself or someone else, then print them out and bring them to the store. Grocery iQ is another app which not only provides you with coupons, it is also a full service grocery shopping management app that lets you build a list of grocery items (either online or on the iPhone). The app has built in coupons that are shown to you for the items you’ve already put on your shopping list. You can use the coupons by printing them out or by adding them to your existing grocery store club cards. Making grocery lists is much simpler than you think, especially on your iPhone since you can just scan the barcode for the products you want to put on your list. Guest Post Note: Special thanks to Ella Davidson of coupons and deals website Coupons.org who contributed to compiling and writing this review. Coupons.org strives to empower consumers with all of the necessary tools to save them more money. AppSafari review of Best iPhone Apps for Finding Coupons was written by Joe Seifi on March 1st, 2012 and categorized under App List, Shopping. Page viewed 7340 times, 1 so far today. Need help on using these apps? Please read the Help Page. We use a coupon app called QuikCoupon for the iPhone. We run a small business and build our own coupons in a minute or two right from the iphone and Email them out to our customers. Very handy coupon app for getting new and current customers in the door.